A modest single storey timber framed house in Adamstown has become a colourful, textured two storey dwelling in this project. 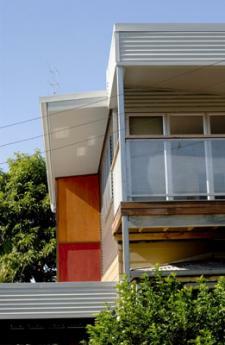 Whilst an assertive building within the streetscape, the dwelling has a true sense of scale, providing both privacy and connection with the site through its articulation.Tri-coloured battened plywood panels are juxtaposed with corrugated steel sheeting to create the playful form that encapsulates the second storey addition. Internal and external louvred walls face into the stairwell, adding solar access, ventilation and spatial connection between floors, removing the limitations of the original ground floor plan. an innate functional sensibility, evident in the interconnected, flexible space and selection of durable materials provides a robust and flexible family home.